MINNEAPOLIS (CNS) — More than a month has passed since the November shooting death of Jamar Clark, a black man, by a white police officer. While protesters, led by the group Black Lives Matter, have moved on from their encampment at the Minneapolis Police Department’s Fourth Precinct, their questions and those of the larger community linger in north Minneapolis and beyond. “It’s been tense. The demonstrations and protests at the Fourth Precinct have affected a lot of people,” said Father Dale Korogi, pastor of Ascension Church, located about a mile northwest of the Fourth Precinct and shooting site. In the shadow of the shooting’s national spotlight, the community awaits answers from an investigation into the circumstances surrounding the death of Clark, 24. He was shot Nov. 15 and died a day later. Police say he was shot during a struggle with officers. Others say Clark, who was unarmed, was handcuffed at the time. Regardless of when the details come to light and what they show, residents say it’s time for change. That change, they say, is only possible if people first acknowledge racial disparities exist. Father Korogi, who grew up in north Minneapolis, said during the weeks-long protests the neighborhood was filled with sounds of news helicopters, and residents were on edge from the uncertainty of the protests and counter-protests. On Dec. 23 protesters organized by Black Lives Matter demonstrated at the Mall of the America, the nation’s largest mall, located in the Twin Cities suburb of Bloomington. In response to a request by the shopping mall’s lawyers for a restraining order on the action, a judge ruled Dec. 22 the organizers could not protest but others could not be stopped from participating in the demonstration. Many Catholics in north Minneapolis know the conversations about race and justice precipitated by Clark’s death have to continue. They say the path to peace starts with listening. The Visitation Sisters of Holy Mary have lived in north Minneapolis for 26 years. Their monastic community consisting of two residences — located about six blocks from the Fourth Precinct — and one community house serves as “a little spiritual hub for people who want to join us for prayer and for a little spiritual nourishment,” said Sister Karen Mohan told The Catholic Spirit, newspaper of the Archdiocese of St. Paul and Minneapolis. “People come here regularly for prayer, and hopefully they are strengthened to do what they need to do. When you meet in the context of prayer . . . everybody’s on equal ground,” she said. The sisters’ presence and ministry to “live Jesus” in the neighborhood came about through trust. In the wake of the shooting and subsequent protests, the sisters have even more neighbors coming to their door who want to talk about race issues. Sister Mary Margaret said these encounters allow them to embrace visitors as authentic individuals. “We are called to be one. If we don’t get that from the fact that God became one with us, then what more do we need?” she said. Sister Mary Frances Reis added that the encounters shed light on others’ experiences. “We as a community know we need to zip our lips and listen to our brothers and sisters,” she said. Bob Briscoe, a parishioner of Ascension, lives in northeast Minneapolis but still spends most of his time in the neighborhood where he first lived upon moving to Minnesota in 2006 — visiting with the sisters, other friends and his daughter, son-in-law and granddaughter. He can attest to the sisters’ approach. “Sometimes you have to get out of your environment mentally and listen to what someone else has gone through all of their life,” he said. Sister Karen, who visited the demonstration site and called the communication there “inspiring,” said the Church’s social justice teachings — specifically the dignity of the human person — are summoned amid the recent violence and people’s concern for justice and peace in an area with prominent racial disparities. Aimee Fritsch is a graduate student and lay community member with the Visitation sisters. She said her Catholic faith allows mercy to play into the recent events in her neighborhood. Heidi Schleif, another lay community member and Ascension parishioner, acknowledges that it might be easy for people to dismiss the issues surrounding the shooting, but that Catholics should pray about them. 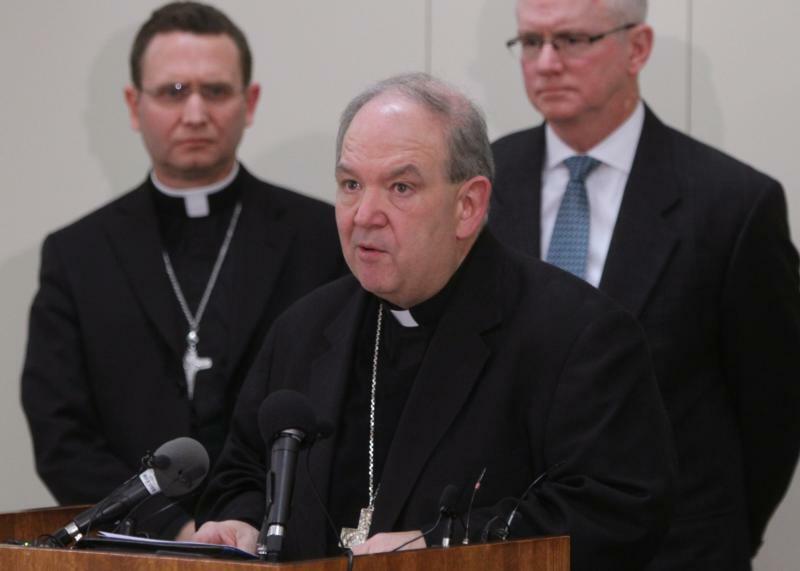 Auxiliary Bishop Andrew H. Cozzens of St. Paul and Minneapolis said amid violence and contention, Catholics are reminded that the Lord said there would be difficult times and that others have lived through similar struggles. “Until we actually try to understand each other, it’s going to be difficult to bring peace,” Bishop Cozzens said, adding that building a culture of understanding could mean reaching out to people and listening. Revealing Christ’s love, he said, is especially appropriate during the Year of Mercy. “The Holy Father is calling us to show mercy by our concrete actions, even if we don’t see the larger effects of it,” he said.